Hiscoe Jiu-Jitsu, Chilliwack, BC | This blog is about my thoughts on various topics that arise in my martial arts training and teaching. What positive effects have martial arts had on your life? Confidence. The most positive effect martial arts have had on my life is confidence. The confidence I have in myself has helped me to achieve and be successful in many aspects of my life. I started martial arts training at a young age and have had the opportunity to do many things in my life. I was a black belt at 14 years old, joined the Canadian Forces Reserve at 17, student council president in my graduation year, joined the RCMP at 20 years old and move across the country at 21. Started my own jiu-jitsu school at 24 years old and a provincial jiu-jitsu association in my late 20’s. 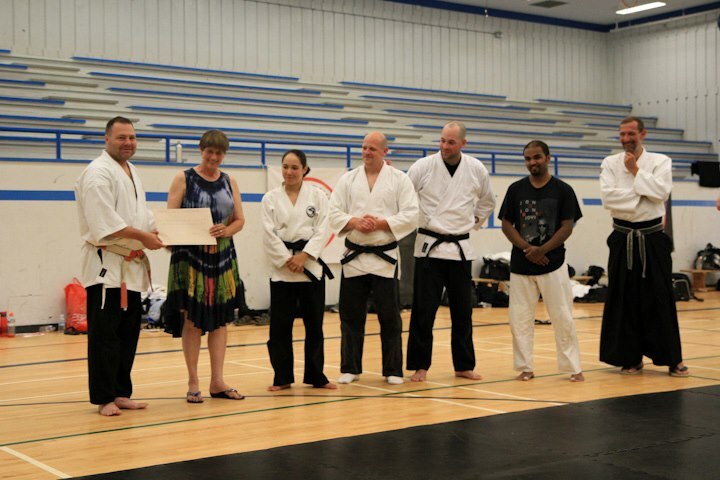 I was also the first person in BC to host a multi discipline training camp and sport jiu-jitsu tournament. I have traveled across BC demonstrating and teaching jiu-jitsu and have traveled to the US, England and Japan. In my policing career I have been a general duty officer, traffic officer, drug investigator, property crimes investigator, training officer, media liaison officer, and volunteer coordinator. When transferred to the provincial training academy I assisted in developing and implementing the first mandatory recertification course in the country. I was also a member of the national core-working group that redesigned use of force training and articulation for all RCMP members in Canada. Most recently I was given the task of rolling out carbine training for front line officers in BC. I have been in acting Sgt and S/Sgt position in charge of up to 30 people. I have had a great 26-year career. Kids who grow up with self-confidence are not bullied, have an easier time making friend and are not afraid to try new things. Confidence, this is positive effect martial arts training has had on my life. So, you’re a black belt and want to open your own school. When I was about 18-19 years old I always thought that having my own dojo would be pretty cool. I had already been involved in martial arts for about 10 years and I loved it, there was no doubt that martial arts would always be part of my life. I was content at the school I belonged to so for me it wasn’t about how I could do it better than they were, I knew that I would be moving to a new city and that the opportunity could arise to do my own thing. A couple of years past and sure enough I did move away and found myself clear across the country and with no jiu-jitsu school in the area. Without getting into a long history lesson, at the age of about 24 I did open a school. Now I had lots of experience teaching classes but I had little experience running a business. Well actually I had NO experience running a business. The school was never financially viable and eventually it was closed. I did however keep teaching in a part time basis for the next 15 years. Last year I re-opened my school somewhat full time and plan on taking it to the next level this year. So why am I writing this? I have been doing a lot of reading about owning a small business and have discovered that most people who open their own business are really “technicians” who were tired of working for someone else or people who have a skill at doing something and want to give it a go. Just like me and jiu-jitsu. The problem is that all small business should be made up of 3 people, the entrepreneur, the manager and the technician. It is very difficult to be all 3, especially when you have another full time job. So I am going to take this year to educate myself on small business and how I should be looking at the future of my school. After 20 years I wish I would have starting learning a long time ago. What prompted you to start your own dojo? What is your role as a self-defense instructor? In the twenty years that I have been teaching self-defense I have literally come into contact with thousands of students. From children, teenagers, young adults, middle aged adults and older adults, men and women. I have had students who have been blessed with natural athletic abilities and some who have had to work really hard to move forward. When I first started my dojo back in 1992 I was only 24 years old and was used to the crash and bang style I had grown up doing. After operating for a few years I quickly realized that the blow throw blow attitude I had about training was not going to be conducive for all students. I still remember one female student who was in her late 40s, had 2 bad knees and other aches and pain on a daily basis. She was already a black belt in karate and had devoted the past 4 years to her learning. Remember when I said some people had to work hard to learn, she worked hard. There were a couple of areas in which she excelled and hardly matched, that was her enthusiasm, dedication and heart. When I promoted her to black belt a few of the other newly promoted black belts questioned her exam. You see she had not perform to the exact same standard as they had. It should be noted that those commenting were in their mid 20s, with natural ability and limited martial arts experience. I explained to them that indeed they had performed an above average test but that each person must also be judged on their own performance. Did she match their test, no, but did she perform to her highest abilities, indeed she did. I currently have a potential student who has come to class and expressed that he really enjoyed what he learned and say. I received an email from him advising he wants to come back but that he doesn’t want to drag the class down. He is a little older then most students but appears to have the desire to learn. If you want to learn, I want to teach. You see my role as a self-defense (jiu-jitsu) instructor is to teach people to protect themselves, this means whoever walks into my dojo and expresses the right reasons for wanting to take lessons. It is not to judge them as they walk into the school and predict that this person will never be a star black belt. My job is to teach them in order for them be the best they can be. Their job is to give me all they have, enthusiasm, attention, sweat, blood, tears….what ever it takes to learn. If we tell them not to bother because they will not achieve black belt then I think we are doing a dis-service. That being said I do have to take into account the individual’s safety in relation to the type of training we do. If the potential student is physically not able to participate and I need to modify my lessons beyond the norm then I would have to discuss with the individual other options. If they give me what I ask for then a black belt in not out of reach, it just might take a little longer. Will it be pretty maybe not but it doesn’t need to be pretty, it needs to be effective. How do you see your role as a self-defense instructor?